BLIND/SIGHT: Conversations with the Visually Inspired is...well, it's profound. It's exhibitions like this, and the unique presentation of the more traditional art exhibitions, that are the reason I thoroughly enjoy the Oglethorpe University Museum of Art (OUMA), always anxiously await the next alluring exhibit. The title of this exhibition alone was enough to entice me. 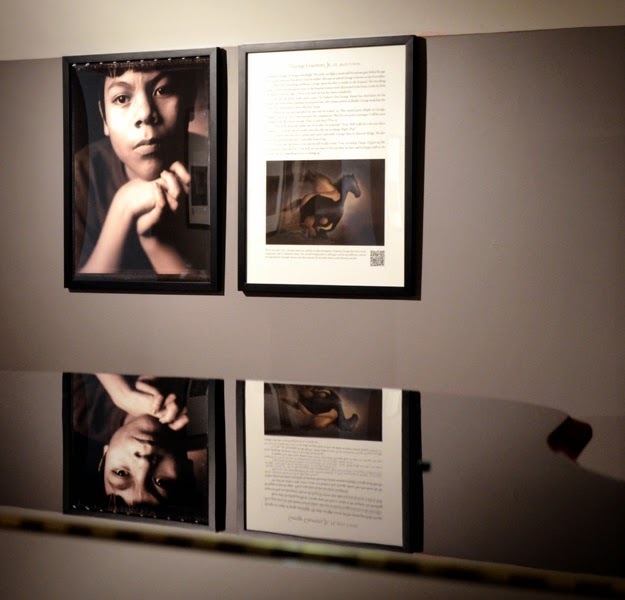 Having heard "visually impaired" for so many years, when I saw "visually inspired", I knew this was a must-see exhibit. 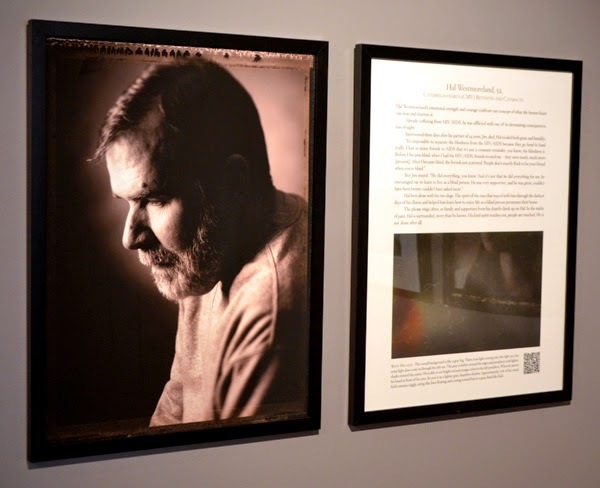 BLIND/SIGHT is a collection of photographs of people with vision loss coupled with a biography of the pictured person, including a description of their vision. And taking it another step further, they've included an interpretive illustration of what each person sees. I've not seen such an exhibition before and find it completely and totally fascinating. Why? My mother's experienced eye trauma during an electrical storm when she was a young girl...she's worn glasses ever since. She's long told us that eventually she'll lose enough of her sight that she'll become legally blind. Thus my interest in vision. Personally, I've had 20/20 all my life...until a few years ago with I started experiencing vision fatigue. It not serious nor debilitating, it doesn't even require glasses, but I finally understood, to quite a small degree, what it was like to not have perfect sight. My compassion grew. There is some excellent programming planned with this exhibition, which is already underway. I have three lectures on my calendar for April! There is a lecture every Wednesday evening, starting at 7:00 p.m. in the Museum. TONIGHT: The presenters range from Allan Eddy, an artist featured in Optic Chiasm, to tonight's lecture presented by the exhibition's photographer, Billy Howard, and the exhibition's illustrator, Laurie Shock. 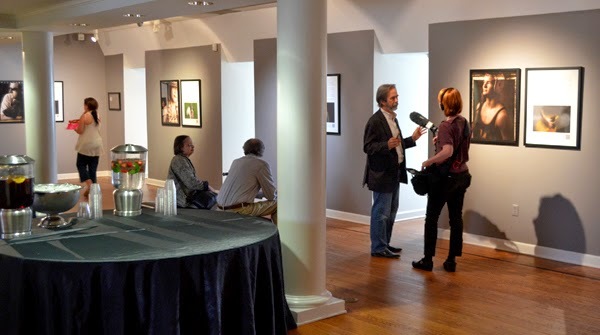 My schedule lined up such that I was able to attend the opening reception for BLIND/SIGHT and Optic Chiasm--running concurrently through Sunday, May 4, 2014. The reception was well-attended and over the years I've noticed an increase in visitorship...a great thing! There was an interview taking place when I was there, but I'm not sure who it was for. To my personal delight, there are many people and news outlets out there reporting on Atlanta happenings. I've shared with you before that I have a mission to make Atlanta a city of back yard tourists...a city filled with locals who explore their own city, not waiting for company to come into town to visit an attraction or museum. A city of citizens who explore Atlanta before their visitors arrive so that they can provide said visitors with a more enriching experience. I hope many will include OUMA in their "We have to go to OUMA because..." planning with visitors. 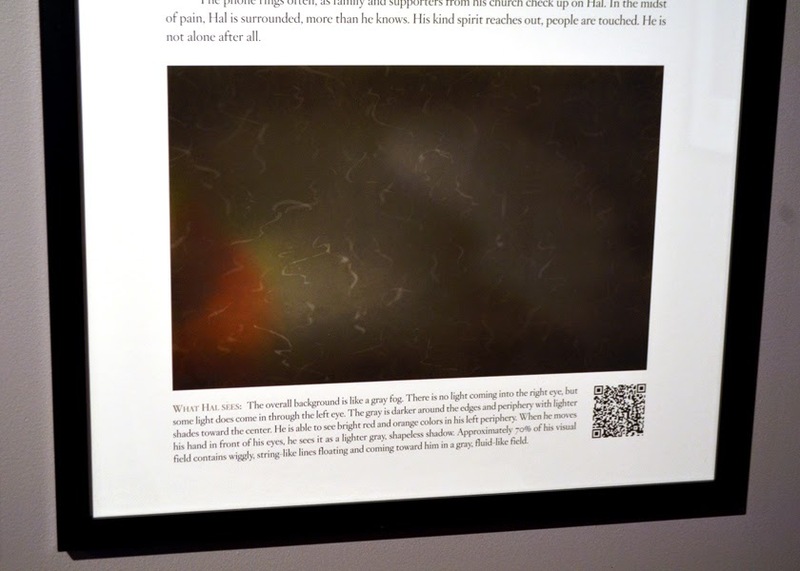 For the visually challenged, there are elements to facilitate a full experience of this exhibition. There are QR Codes on each piece that offers an audio presentation. And items in the exhibition that invite visitors to "Please Touch". The first time I saw a QR Code was at the Museum of Design Atlanta (MODA), when they were still in Downtown Atlanta. I was beyond excited about the technology and its many possibilities. It's great to see them being used for the visually impaired in this OUMA exhibit. BLIND/SIGHT celebrates the 50th anniversary of the Center for the Visually Impaired, Georgia's largest provider for the blind and visually impaired. This exhibit gets high praise and recommendation to see from wanderlust ATLANTA. OUMA has long been a favorite museum of mine. I called it one of Atlanta's 'best kept secrets' a few years ago, but I see that changing. 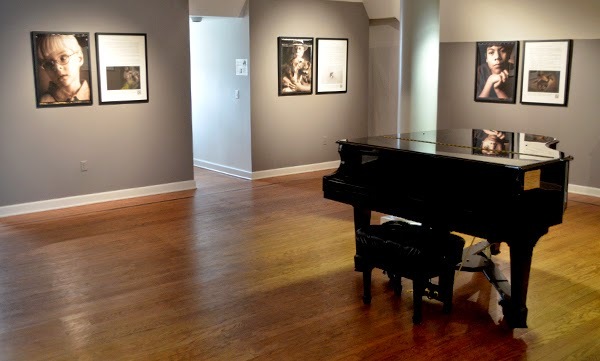 Check out the Oglethorpe University Museum of Art...I think you'll be fascinated with the caliber of exhibits they present...and of course, visit in person!